I should see the striking Mt. Shasta several times as I make my way through the Siskiyou’s, Marble Mountains and Trinity Alps— and quite likely after I cross Interstate 5. Mt. Shasta is part of the volcanic Cascade Range that stretches up to Canada. It’s time to get down to the nitty-gritty planning of my thousand mile trek from Mt. Ashland in Southern Oregon to Mt. Whitney in California. I’ve been poring over maps, thinking about distances and planning out resupply points. I love maps, so this is a fun activity for me. I think I am being realistic, but you never know. Most through hikers (as people who hike the whole PCT are called) can average around 20-25 miles per day. Maybe even more. That’s a marathon per day! But the 75-year-olds out there are few and far between. I am planning on 12-13. If I can do more, great. Today, I am going to share the first half of my route, approximately 500 miles, beginning at Mt. Ashland and ending north of Lake Tahoe. While I have backpacked in the Marble Mountains, Trinity Alps, and Lassen National Park, it is the area I am least familiar with. Once you hit Interstate 80 southward to Mt. Whitney, the second half of my journey, you are in my ‘old stomping grounds,’ so to speak. I’ve hiked through this country many times over the years. Below is a map of the first half of the trail. This map of the PCT traces my route from Mt. Ashland to Lake Tahoe. While not as clear as I would like, it provides a good overview. Peggy and I live just north of the trail where it snakes its way along the California/Oregon border. Our property backs up to national forest land. The Sierra Nevada Mountains provide some of the most beautiful hiking in the world. They are John Muir’s Range of Light. The northern part of my journey lacks the drama of the Sierra’s, but there is still considerable beauty in the Siskiyou’s, Marble Mountains and Trinity Alps. Once I cross Interstate 5, I have Burney Falls and Lassen National Park to look forward to. Here are a few photos I have taken over the years to whet your appetite for what is coming. The PCT works around the edge of the Red Buttes Wilderness where Peggy and I have been backpacking the last few years. This small lake is in the wilderness. As are a number of giant trees such as this sugar pine Peggy is standing next to. And this large red cedar. Last year Peggy and I followed what is known as the Cook and Green Trail up to the PCT. We camped under this canopy of trees. We found three through hikers on the pass. They were quite excited to be nearing the Oregon Border after their long sojourn from the Mexican Border. Most through hikers travel south to north. We also found a PCT trail marker. They will serve as my guide on the trek. The trail is well-marked for the most part. Where it isn’t, I’ll be using other guides, like maps and tree blazes. The Marble’s and the Trinity Alps have numerous pristine lakes such as this. And mountains. These are part of the Trinity Alps. There are lovely flowers to admire, such as this Tiger Lily. And possibly bears. This tree has been well-marked by bear claws! Peggy and I were in the Marble Mountains a few years back celebrating her birthday with a small cake I had brought along when a bear decided to drop in. Peggy told it in no uncertain terms that it was not invited to the party! Rather than face such a formidable opponent, it remembered some ants it wanted to eat. Once across I-5 , I will travel 83 miles to reach Burney Falls. In this photo, a lone Ponderosa Pine grows between the two channels. The water shooting out from the rocks provides an almost etherial quality to the falls. Peggy will meet me at the falls with resupply. Basically, she will be catching up with me once a week and I will have a layover day to feast, shower, and hopefully put up a post on my previous 6-8 days. A final view of the falls. Another week down the trail should bring me to Lassen National Park, one of two parks I will be hiking through. The other is Yosemite. Mt. Lassen looms above the meadow. I’ve climbed to the top of both Lassen and Shasta. I thought this reflection shot of the mountain was fun. I’ll close today with this view of a stream winding its way through a park meadow. Next Tuesday, I will take you through the second half of my journey from Lake Tahoe to Mt. Whitney. Peggy and I will be doing our 40 mile conditioning trip down the Rogue River Trail. I should say conditioning plus trial. I’ll be carefully monitoring how my body responds to being back out on the trail with a loaded pack! FRIDAY’S POST: MisAdventures. It is really hard to be a sports hero when you are as blind as a bat! Especially when it comes to playing hard ball… “Where’d that ball go?” Bonk! We were nearing the end of our 18-day journey down the Colorado River and had left the Grand Canyon behind. There were still spectacular views, however. The river was slowing down, backing up as it approached Lake Mead. The rapids were behind us. We formed a flotilla and leisurely made our way toward take-out. We were ending our 18-day raft trip that had taken us through the Grand Canyon. Today’s photo essay reflects our final three days. It is Earth Day tomorrow, and few things remind us better than the Grand Canyon that there are beautiful, wild places on earth that deserve our love and protection. I bumped up my normal Monday post to Saturday in honor of those who have fought so hard to save the Grand Canyon— and the earth. Enjoy. And then lines up with several of our women rafters for a photo op. Our journey had been about several things, but certainly the people were central to the experience. We had a whole cast of characters, including Yours Truly, looking like I had just spent 18-days on the river. Peggy balances on the end of a raft and assumes a Titanic pose, which is something she likes to do. I have another photo of her like this poised above the piranha infested waters of the Amazon River. And Bone, of course, who found a prickly seat for this photo. More than anything else, our trip was about rafting through the Grand Canyon. I took this photo of Hance Rapids from the rim after the trip. Each set of rapids was unique, and some were massive. Boatmen live for the challenges these rapids provide and our boatmen proved to be experts at negotiating them. 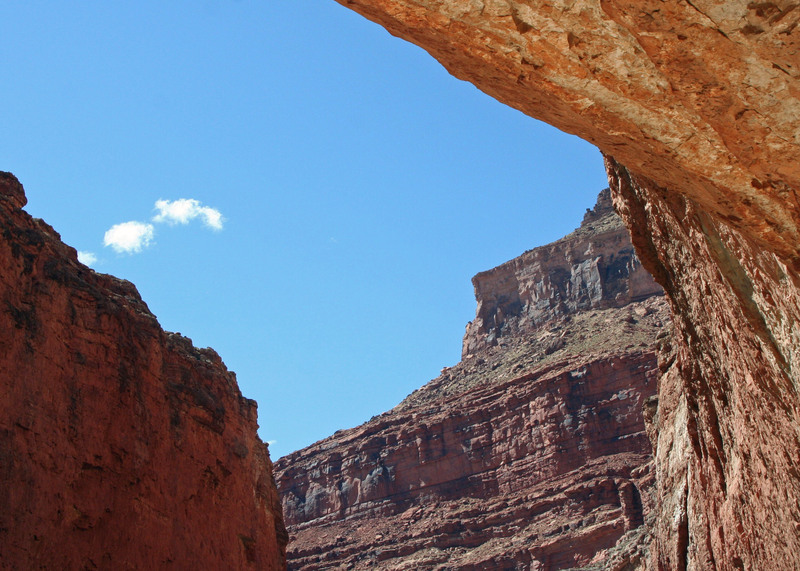 For me, the journey was more about the incredible beauty and natural history of the Canyon. The beauty continued even as we approached Lake Mead and our take-out. The Canyon walls were particularly beautiful in early morning and evening light. But there was beauty any time of the day, and along every mile we traveled. The Hualapai Indians provide a different perspective from their Skywalk, which is perched 4000 feet above the river. And our eyes were always searching for wildlife along the river, such as these Big Horn Sheep. Eventually all great adventures come to an end. Here we are deflating the rafts that it seemed like we had filled ever-so-long before, literally lying down on the job! A special thank you to Tom Lovering for organizing and leading our adventure. As you may very well imagine, a great deal of effort and expertise goes into planning a trip like ours. BTW, this may be the only time you ever see Tom with a halo. And a special thanks to Don Green who so generously allowed me to use some of his excellent photos from along the way. Bone, whose vest has now been signed by all of the rafters, looks down on Tanner Rapids, which we had made our way through a couple of weeks earlier. In addition to rafting through this section of the river I’ve backpacked into it twice and Peggy has backpacked into it once. 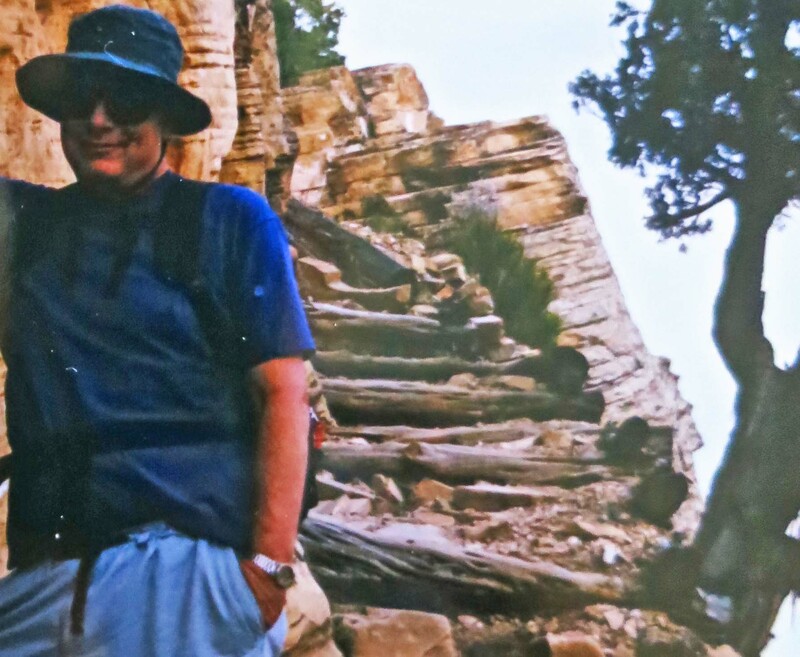 I hope you have enjoyed this trip down the Colorado River through the Grand Canyon along with Peggy, me and our friends. Thanks for joining us! The Canyon is a very special place. And it is one of the world’s greatest natural wonders. Happy Earth Day! As we passed outside of the Grand Canyon National Park boundary, the Canyon lost some of its grandeur, but just barely. I wasn’t too surprised when Susan Gishi sported Romaine Lettuce as rabbit ears. In fact, wandering around with my camera, I may have encouraged her. Nor was I surprised when she wielded the cutting knife threateningly. Or when the kitchen crew started head loading the salad containers (not too successfully). Tom ran a tight ship in the kitchen and his mutinous crew responded with humor. After 15 days on the river, his efforts at organization were somewhat analogous to herding cats, or maybe kangaroos. It tended to make him grumpy. Susan demonstrates how to wear Romaine Lettuce, and the proper way to cut it. This is the rowdy kitchen crew, Susan, Peggy and Eggin. Susan demonstrating how to head load. A convenient ledge provided first row seats to watch the crews shenanigans. Later, Teresa decided to become a stalker. While Don Assumed the pose of the thinker. Hopefully, the rope stayed in place. His shirt makes a ghost appearance. As we passed outside of the National Park boundary on our trip down the Colorado, the Canyon lost some of its grandeur. But there was still plenty to see. Pumpkin Springs was a good example. It looked like a huge pumpkin. Beth, whose nickname is Pumpkin, was glad to climb up on top of the springs for perspective. The gourd-like structure is another example of a travertine formation created by the lime pumped out by the hot springs. An interesting note is that the spring also has a high concentration of arsenic. Health standards are set at 50 milligrams per liter. The level at Pumpkin Springs has been measured at over 1000! Don’t drink the water! Bone, of course, had to take a sip, but doing anything he does usually has an inherent risk. I once watched him dive into a pitcher of margaritas at Senior Frogs in Mazatland, Mexico and refuse to come out until a señorita gave him a kiss. Rock formations continued to entertain us. And columns of basalt. They reflect the way basalt may crack when it cools slowly. The Devil’s Postpile along the John Muir Trail is one of the best examples of this phenomena. A view of Pumpkin Springs. Beth provides perspective on the size of the springs. While Bone gets up close and personal. Peggy and I both took turns at the oars. Peggy’s was mainly a photo-op but I rowed for a longer period, giving Dave a break. He even encouraged me to try my luck at death-defying rapids (more like a 1 on a scale of 10.) “Point toward the V made by the water and stay in the center,” Dave had advised before going back to sleep. Dave taking a snooze while I row. This is an example of the small rapids I rowed through. A final view of the Canyon for today. WEDNESDAY’S POST: Up close and personal with the big brown bears of Kodiak Island. FRIDAY’S POST: Living on Graveyard Alley— or not. It’s a wrap on the Mekemson Kids Did It. Matanuska Glacier is one of the sights along the road from the Canadian/Alaskan Border to Anchorage. I lived in Alaska for three years between 1983-86. While the organization I was executive director of was in Anchorage, I wandered over much of the state, backpacking in numerous areas including Gates Of the Arctic National Park, kayaking in places like Prince William Sound and cross-country skiing, which included a trek into Denali National Park where we camped out in 30 (34 C) degrees below zero weather. You go to bed with your shoes and a hot water bottle! The beauty and wildness of the state is legendary. Yes, there are insects galore, big bears with sharp teeth, moose, and wolves. But they come with the territory. Our drive from the Canadian Border to Anchorage was much tamer, but the beauty was there, as you can see from the following photos. Speaking of wildlife, we spotted this beauty at the King Mountain Lodge. Can wildlife get much wilder? Bright fields of fireweed contrasted with the darkness of black spruce along the road. The road continued to wind among almost mystical mountains. This mountain is part of Wrangle St. Elias National Park, one of the most remote and untamed national parks in the world. This cache is a bit on the fancy side, more for tourists than keeping out the bears that want to raid your food supplies. But you get the idea. Glacial rivers are gray from the rock ground off of mountains. Another view of Matanuska Glacier. I really liked this view of mountains along the highway. More mountains. These with a different look. An appropriately painted house along the route. The bar at King Mountain Lodge. Road houses were once common along the highway, and necessary to accommodate travelers who couldn’t travel long distances over the rough highways on a given day. Most were quite colorful, and often filled by interesting characters. King Mountain continues to provide an interesting place to stop. Peggy found this motorcycle inside. The owner, seeing her interest, took her out for a spin. A photo of Libby Riddles was on the wall. Libby was the first woman to win the Iditarod, the world-famous sled dog race from Anchorage to Nome. And she did it while I was in Anchorage. I called her and asked if she would be spokesperson for my organization. She agreed. I picked her up at the airport where she had just returned from a photo-shoot with Vogue Magazine and we spent a couple of days together as we ran around to all of the local media. A shot of Libby and me sharing a laugh in the mid-80s. I found this lovely pond on the edge of the highway. These are the mountains that backed up to my home in Anchorage. I could be up in them in 30 minutes and would often go on hikes after work. One of my trips was a 25-mile day hike where I came out in this canyon. It included crossing a fairly substantial glacial river where I had to save my hiking companion from being swept away. I’ll conclude with this sunset. In next Monday’s post I will take you off to the island of Kodiak for a visit with brown bears! FRIDAY’S POST: The Mekemson kids are at it again and a railroad detective shows up at out house to accuse my brother of dark deeds, which fortunately, he didn’t do. 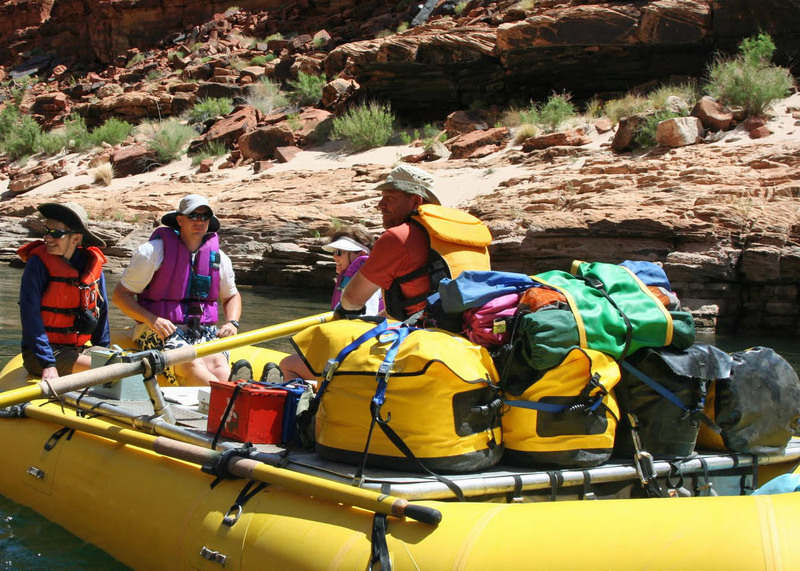 MONDAY’S POST: We continue our 18 day trip by raft down the Colorado River through the Grand Canyon. Peggy standing next to Deer Creek Falls in the Grand Canyon. “It is especially cold in the rain tonight. The little canvas we have is rotten and useless; the rubber ponchos have all been lost; we have not a blanket apiece. We build a fire; but the rain, coming down in torrents, extinguishes it, and we sit up all night on the rocks, shivering…” From the diary of the one-armed John Wesley Powell on the night of August 17, 1869 during his epic exploration of the Grand Canyon. Well, there are ADVENTURES and there are adventures. 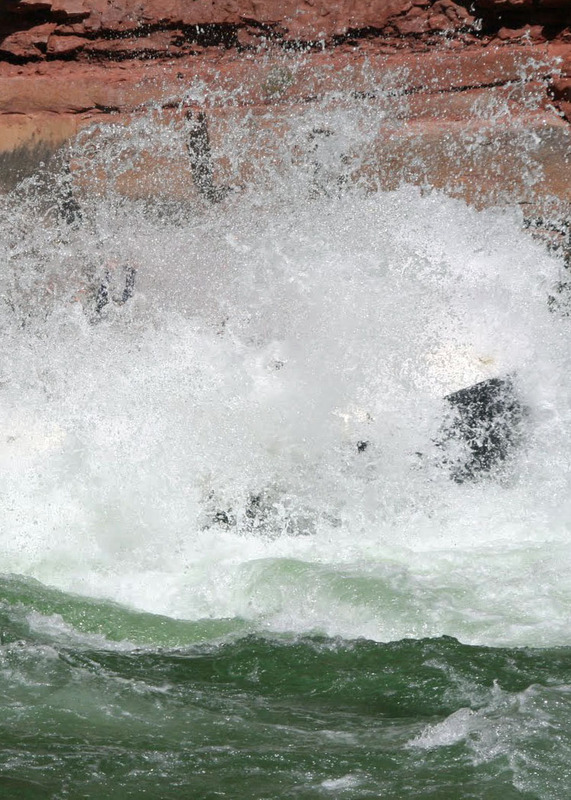 Today I will focus on our 8th, 9th and 10th days on the Colorado River. There are rapids, but nothing to write home about. In camp, the fabled heat of the Grand Canyon makes an appearance, so we put up a sun shelter and snooze. It’s a bit of a climb up to Christmas Tree Cave, maybe 10 minutes. We do, however find a very strange creature there, something that might give you nightmares. We stop to admire Deer Creek Falls and then climb up the Deer Creek Canyon, which is much more of a climb than it was to the cave, but a natural Jacuzzi greets us at the top. The water is cold. Things are tough, right? As I said, there are ADVENTURES and then there are adventures. (Grin.) I let photos tell today’s story. Rowing is a given, lots of it, but unless we are rowing against the wind or maneuvering through rapids, the river does much of the work. Take a cold beer or two, add in a warm sun, comfy chairs, and shade, it’s time for a snooze. And this is Peggy. I can only wonder how she does it. And in the early morning light. Looking up at the entrance to Christmas Tree cave. The name derives from a crystalline structure that looks something like a Christmas tree. Okay, imagine you are alone and making your way through a large, semi-dark cave when you suddenly come face to face with this cave troll. The Christmas Tree, BTW, is to the right of Tom. I really like the perspective on the size of the cave in this photo that Peggy took. Deer Creek Falls was a treat. Hiking up the Deer Creek trail provided more delights. It was a tad cold. Bone was probably the least bothered by the cold of any of us. Maybe it was his warm vest. Tom and Don make a hand off. Bone wanted to leap off on his own but we were afraid that the creek might carry him away! 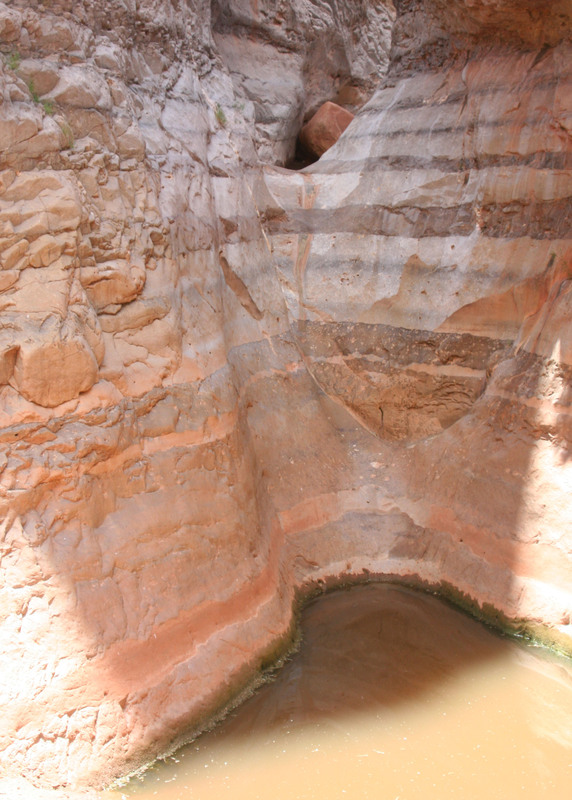 Deer Creek had cut its way into the soft sandstone, creating a min-Grand Canyon of its own. Which led Peggy and me to take numerous photos. And another opportunity to rest. Check out the shade on the left. Our final photo of the day. Looking down on the Colorado River from the Deer Creek trail. WEDNESDAY’S POST: We arrive in Alaska on the Alaska Highway. Now we will be making our way from the Canadian Border to Anchorage. Be prepared for glaciers! FRIDAY’S POST: The MisAdventure series. The railroad detective comes to visit. Were the Mekemson kids guilty of tearing apart a railroad trestle? Tune in on Friday. I’ve just returned from playing for a week while celebrating my 75th birthday. So, I am a bit behind on writing posts and keeping up with comments and fellow bloggers. My apologies. It isn’t going to get much better. (grin) On Wednesday, Peggy and I fly back east to visit with our son and his family in Connecticut. We return from there just in time to fly to North Carolina and see our daughter and her family. After that, we will spend a month exploring several national parks in the southwest on foot. Then it will be time for another Grand Adventure. I intend to walk out my backdoor in Southern Oregon and backpack 1000 miles to Mt. Whitney in California following the Pacific Crest and John Muir Trails. It’s a journey not many people make— especially 75-year-olds. “And what did you do this summer, Grandpa?” Going, of course, will depend on my doctor saying “Why not?” I hope to gain a book contract to write about the trip. Wish me luck on that one. I will be blogging much more about the trek in posts leading up to the adventure. Looking down into the Grand Canyon at the start of the Tanner Trail. The curve you can see in the Colorado River is the Tanner Rapids, which is where we will be on our next section of our raft trip down the Colorado. Years before I rafted the Canyon I backpacked into it several times. Two of my trips were by the Tanner Trail, once by myself and once with Peggy. “It’s not too late to make another decision,” my body told my mind as I hoisted my 60-pound pack and eyed the distant Colorado River. “There is a fine lodge with great food and even better beer 30 minutes away. It provides a fantastic view of the Grand Canyon. Much better than anything you will see on the insane hike.” “Shut up and walk,” my mind replied. Tanner Trail dropped away under my feet as I made my first steps down the steep, poorly maintained path and descended through millions of years of earth history. About a half of a mile down, the trail disappeared, having been washed away by winter rains. “I told you so,” my body whispered loudly as I mentally and physically hugged the side of the Canyon and tentatively made my way around the washout with its thousand foot drop. Although this photo is a little blurry and from another non-maintained Grand Canyon trail, I included it because it provides a perspective on the trails into the Canyon that receive minimal attention from the Park Service. Main tourist trails are like freeways in comparison. 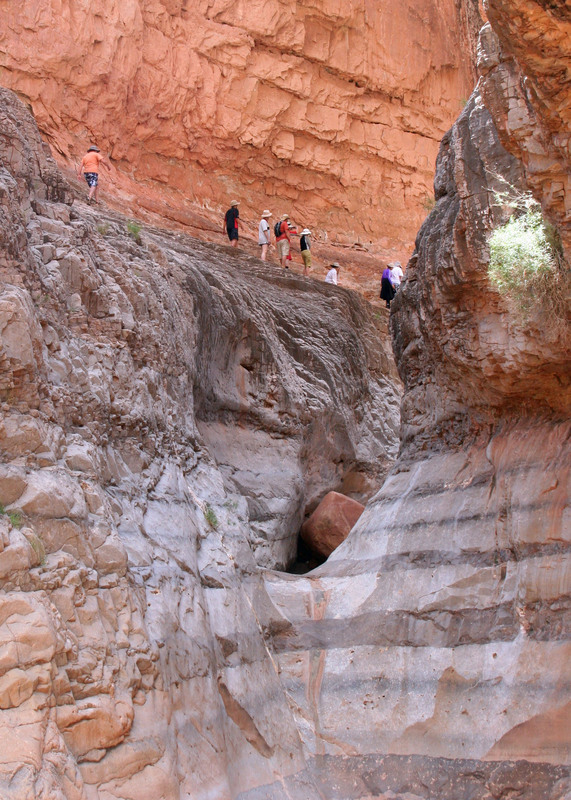 Steep drop offs are a common factor with all trails leading into the Grand Canyon. The first trails were created by Native Americans. Later miners, rustlers, and companies interested in promoting tourism would enhance the original trails and create new ones. I am not sure when my legs started shaking. Given the stair-step nature of the trail and the weight on my back, not to mention an extra 20 pounds of winter fat, my downhill muscles were not having a lot of fun. Fortunately, Mother Nature provided a reprieve. 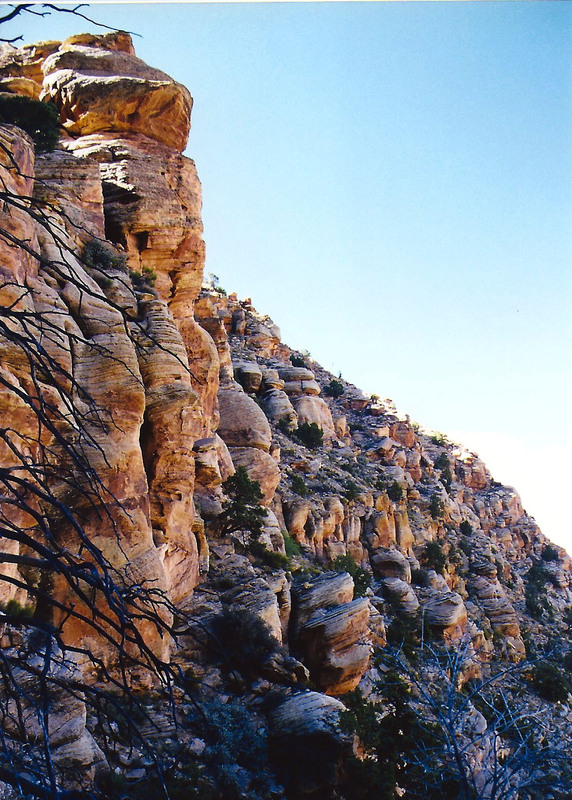 The erosive forces of wind and water that have sculpted the mesas and canyon lands of the Southwest are less challenged by some types of rocks than others. Somewhere between two and three miles down I came upon the gentle lower slopes of the Escalante and Cardenas Buttes, which allowed me to lollygag along and enjoy the scenery. I escaped from the sun beneath the shadow of a large rock, drank some of my precious water, nibbled on trail food, and took a brief nap. It would have made a good place to camp. Others had obviously taken advantage of the shade and flat surface, but the Colorado River was calling. Ignoring the screams of my disgruntled body parts, I headed on. At mile five or so my idyllic stroll came to a dramatic halt as the trail dropped out of sight down what is known as the Red Wall. (It received this imaginative name because it is red and looks like a wall.) 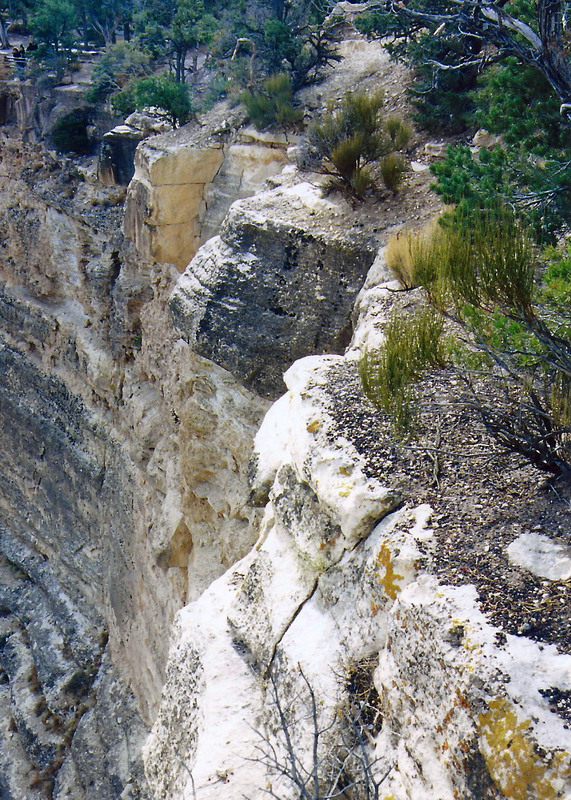 Some fifty million years, or 625,000 Curtis life spans, of shallow seas had patiently worked to deposit the lime that makes up its 500-foot sheer cliff. 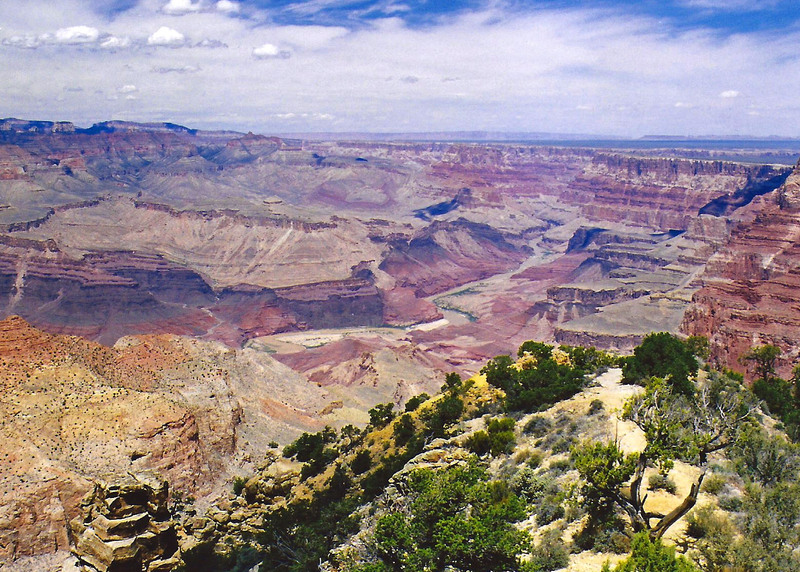 It is one of the most distinctive features of the Grand Canyon. My trail guide recommended I store water before heading down so I could retrieve it when I was dying of thirst on the way out. I could see where people had scratched out exposed campsites here as an excuse to stop for the night. The accommodations weren’t much but the view was spectacular. The rest of the five-mile/five month journey was something of a blur. (It was closer to five hours but time was moving very slowly.) 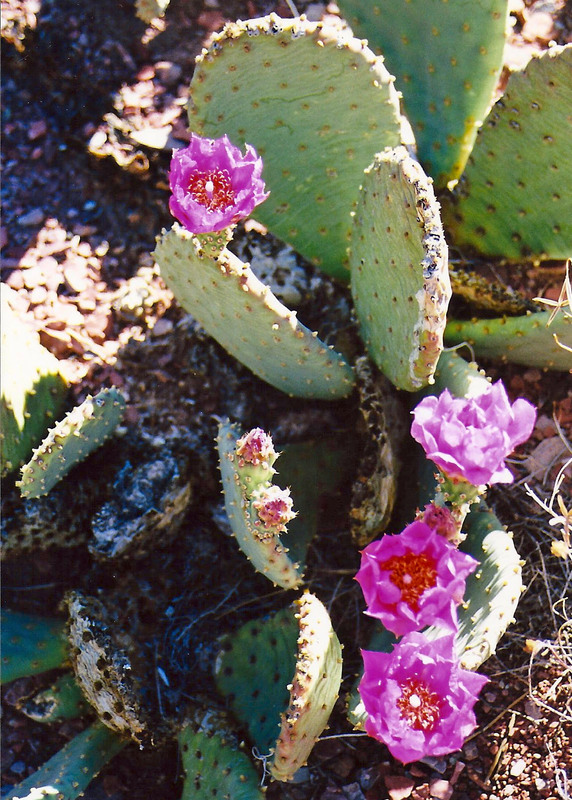 I do remember a blooming prickly pear cactus. I grumbled at it for looking so cheerful. I also remember a long, gravelly slope toward the bottom. My downhill muscles had totally given out and the only way I could get down was to sidestep. I cackled insanely when I finally reached the bottom. I growled at a prickly pear for looking so cheerful. Looking back up the trail provided a perspective on how far I had come. 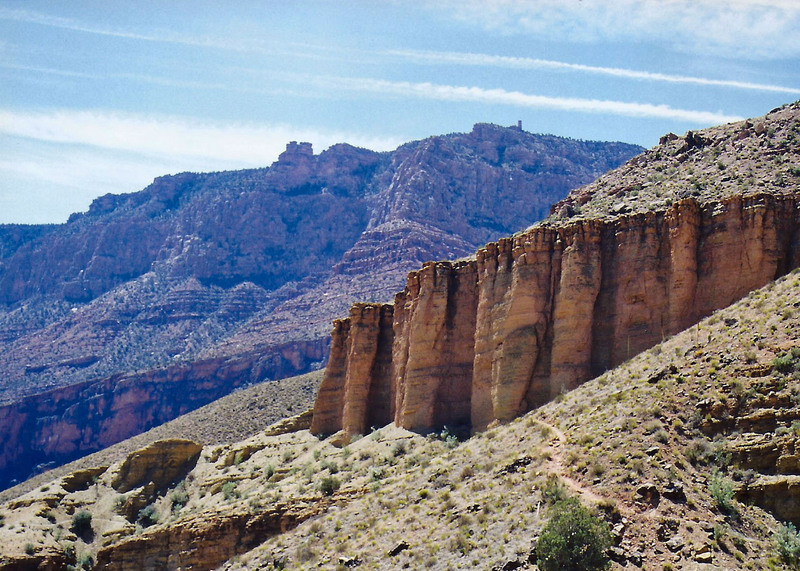 The small, needle-like structure is Desert View Tower, about a mile away from the Tanner trailhead. You can see the trail on the right. Setting up camp that night was simple. I threw out my ground cloth, Thermarest mattress, and sleeping bag on a sandy beach. Then I stumbled down to the river’s edge and retrieved a bucket of brown Colorado River water that appeared to be two parts liquid and one part mud. I could have waited for the mud to settle but used up a year of my water filter’s life to provide an instant two quarts of potable water. 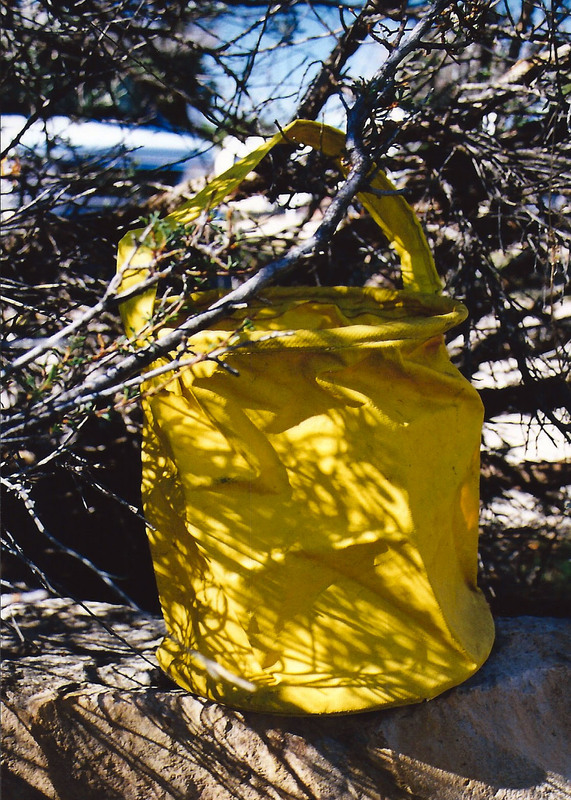 My old yellow bucket, a veteran of dozens of backpacking adventures, holding Colorado River water. It retired after my second trip down the Tanner Trail. All I had left to do was take care of my food. Since people camped here frequently, four-legged critters looked on backpackers as a major source of meals. I could almost here them yelling, “Dinnertime!” when I stumbled into sight. Not seeing a convenient limb to hang my food from, i.e. something I wouldn’t have to move more than 10 feet to find, I buried my food bag in the sand next to me. Theoretically, anything digging it up would wake me. Just the top was peeking out so I could find it in the morning. As the sun went down, so did I. Faster than I could fall asleep, I heard myself snoring. I was brought back to full consciousness by the pitter-patter of tiny feet crossing over the top of me. A mouse was worrying the top of my food bag and going for the peanuts I had placed there to cover my more serious food. “Hey Mousy,” I yelled, “Get away from my food!” My small companion of the night dashed back over me as if I were no more than a noisy obstacle between dinner and home. I was drifting off again when I once more felt the little feet. “The hell with it,” I thought in my semi-comatose state. How many peanuts could the mouse eat anyway? The river water I had consumed the night before pulled me from my sleep. Predawn light bathed the Canyon in a gentle glow. I lay in my sleeping bag for several minutes and admired the vastness and beauty of my temporary home. The Canyon rim, my truck and the hoards of tourists were far away, existing in another world. My thoughts turned to my visitor of the previous evening. The early morning view from my camp site near Tanner Rapids on the Colorado River. Out of curiosity, I reached over for my food and extracted the bag of peanuts. A neat little hole had been chewed through the plastic but it appeared that most of my peanuts were present and accounted for. My small contribution had been well worth my solid sleep. I then looked over to the right to see if I could spot where the mouse had carried its treasure. Something on the edge of my ground cloth caught my eye. It was three inches long, grey, round and fuzzy. Something had sat on the edge of my sleeping bag during the night and dined on peanut stuffed mouse. Thoughts of a coyote, or worse, using my ground cloth as a dinner table sent a shiver down my spine. I ate a peanut in honor of Mousy’s memory and threw a few over near his house in case he had left behind a family to feed. I also figured that the peanuts would serve as an offering to whatever Canyon spirits had sent the night predator on its way. 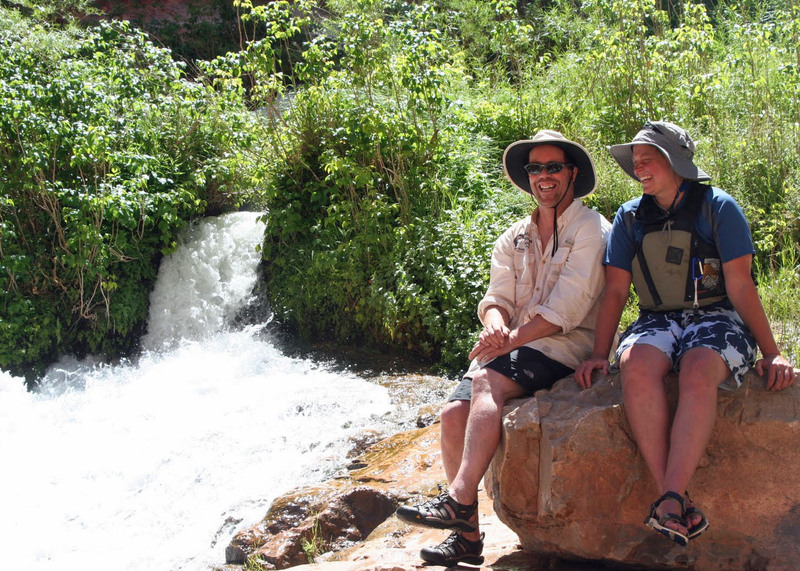 Next Monday’s Post: I return to our raft trip down the Colorado. WEDNESDAY’S POST: Driving on the Alaska Highway through the Yukon! FRIDAY’S POST: It’s back to MisAdventures. It was almost a mantra in Diamond Springs where I grew up: If there was mischief in the town, the Mekemson Kids Did It. Day two starts as day one did: early. Even the birds are sound asleep. Tom argues it’s six a.m., not the five my watch is showing. “Arizona does not honor Daylight Savings Time,” he primly informs us. He’s right. Adjusting my watch adjusts my attitude— a little. Adding injury to insult, something akin to Folgers has been sewn up in burlap, thrown in boiling water, and called coffee. Oh well, it’s hot, it’s brown, and we have a beautiful day of floating down the Colorado through the Grand Canyon ahead. For those of you who like facts, here are a few about the river. At its widest point it reaches 750 feet from one bank to the other; at its deepest, it plunges down 90 feet. It flows along at a decent 3-4 mile clip but can speed up to 15 miles per hour in rapids. Since the water comes out of the base of Glen Canyon Dam, it is cold: somewhere around a frigid 46 degrees Fahrenheit during the upper part of our trip. Over the course of our adventure the river will drop 1700 feet in altitude, which is an average 8 feet per mile… 25 times that of the Mississippi River. 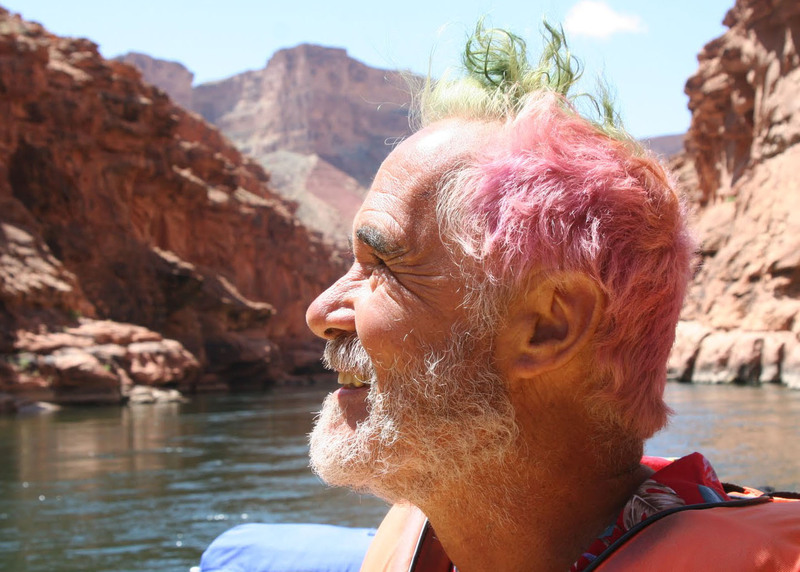 Our boatman for the day, Tom Lovering, with his wild, Canyon hairdo. And snuggled up with Tom. Tom is our boatman for the day. He checks to make sure our toenails are painted and then lets us board. The wind is still blowing but it has lost its ferocious bite. A mile down the river we pass Ten Mile Rock, a prominent landmark that has fallen from the cliffs above and now juts up out of the river. Made of Toroweap Sandstone, it was laid down in shallow seas that covered the area some 250 million years ago. Floating by Ten Mile Rock. You wouldn’t have wanted to be near here when this massive chunk of sandstone broke off from the Grand Canyon walls high above the river. Shortly afterwards we hear our first rapid of the day, Soap Creek. You always hear rapids before you see them; it builds anticipation. Soap Creek roars like a teenage lion. Tom maneuvers through it like the excellent boatman he is but makes sure we get suitably wet. It’s like taking a cold shower outside on a frosty morning with a 15 mile per hour wind blowing. “I love rowing,” Tom tells us— and it is obvious he does. It is more than the heart-stopping, adrenaline-pumping moments of major rapids where the boatman’s knowledge and skill is matched against the tremendous power of the river with its dangerous rocks and grasping holes. And it is more than the opportunity to enjoy incredible beauty of the Grand Canyon that rowing provides. Tom enjoys the rhythm and the hard work. He even liked the backbreaking challenge of rowing against the wind the day before. Keeping a sharp eye out will reward you with views of canyons within the Canyon. Don’t you want to go exploring? And almost any view up or down the river is a treat. At mile 17 we come on our first, and only, major challenge of the day, House Rock Rapid, where we learn another fact about rafting through the Canyon: water levels depend on electricity needs in the West. 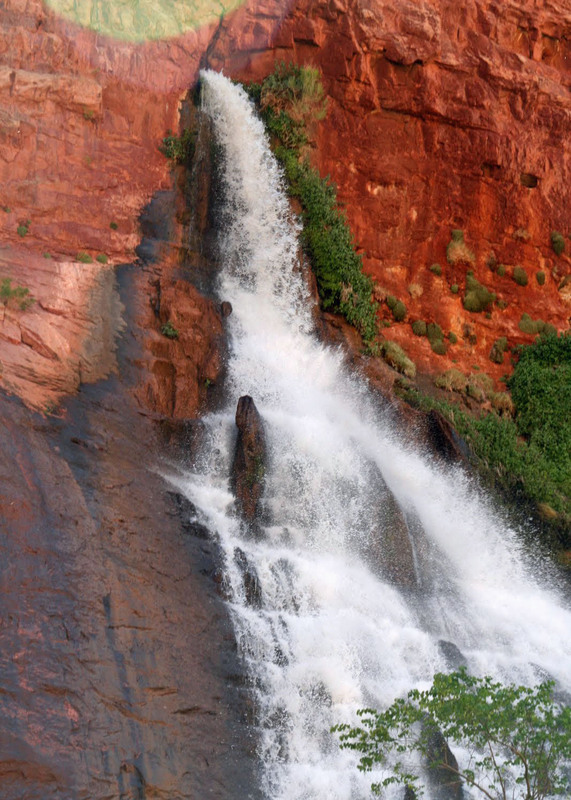 Peak demands require large releases of water from Glen Canyon Dam to run its huge generators. Eventually, these releases catch up with rafters. The fluctuations in water levels have significant impacts. House Rock Rapid demonstrates one of the more serious. The river is at its low point. More rocks are exposed and a massive hole lurks downstream from the largest rock. Even the most skilled boatman will be challenged to avoid it. We all land and climb off our boats to scout the rapid. Tom is eager to move on. Steve is adamant about waiting for more water. After a long discussion between the boatmen, a decision is made to take the more cautious approach. All of our boatmen are experienced, and Steve and Tom have been down the river many times. They respect each others opinions. As with most aspects of dealing with natural forces, it is best to error on the side of caution when you have the opportunity. There are plenty of times when you don’t. Our group worriedly scouts House Rock Rapid. Peggy shows more enthusiasm than may be called for. We have lunch, take naps, go for walks and watch as three large boats of commercial rafters chug through the rapids with their large engines. It is mid afternoon when the boatmen finally decide that enough water is flowing to reduce the hazard to a barely acceptable risk. Tom’s fist knocks me on the head when we are halfway through. One of his oars has popped out. I look left and all I can see is churning, raft-eating hole. We are poised on the edge— about to be sucked in! Tom becomes a virtuoso of one-armed madness. Ever so slowly, like about a thousand years, the boat decides to go where he wants. We land, and for one of the few times in his life, my ever-talkative friend is silent. We looked to the left and saw that we were poised on the edge of a massive hole with a rock in the middle. The next day, Eggin Stalheim, Dave’s niece, is our boat woman. 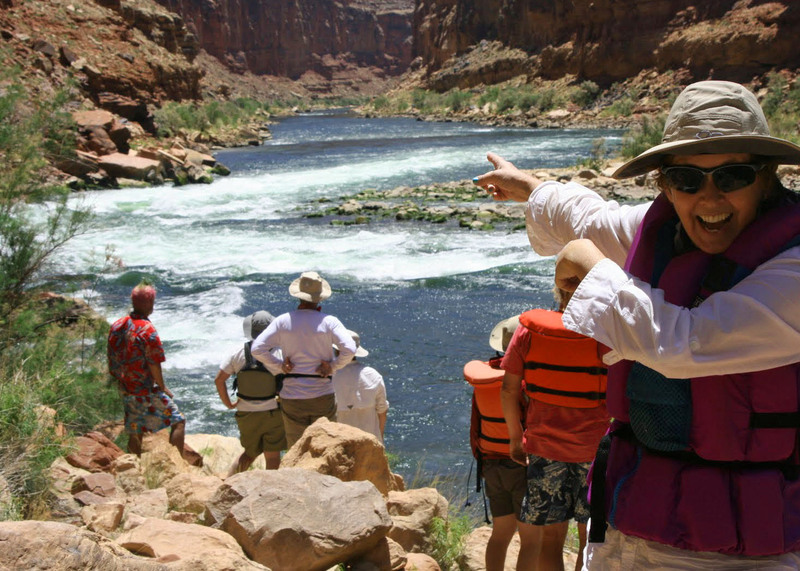 This is Eggin’s first time rowing a raft and her first time rowing through the Grand Canyon. It would seem insane except Eggin is a world-class kayaker. She is an expert at reading water. The problem is that our large, fully loaded rafts do not move like feather-light kayaks—picture driving an 18-wheel Mack Truck with a Ferrari 458 attitude. We have some adventures. This shot of Jamie’s raft provides a perspective on what our fully loaded rafts looked like. Eggin keeps the messy side up, however, as rafters say. (The non-messy side is the smooth bottom of the raft.) So it’s all good. Eggin, like me, has served as a Peace Corps Volunteer in West Africa. When she gets off the river she is heading for Tanzania where she will work with a women’s craft co-op. Beyond our “kayaking” experience with Eggin, the big news on day three is that we began our side-trips. Almost all journeys down the Canyon include stopping off to see the sights. Some are quite beautiful and others provide unique challenges, as if our daily challenges of negotiating rapids aren’t enough. Our first stop at mile 29 is the Silver Grotto, which includes both beauty and challenge. Wanting a little downtime and solitude, I opt out and take photos. Peggy tells me, “We climbed an 8 foot wall, repelled down a rock face, slogged through a murky, cold pool and slid down a 20 foot rock slide.” The rock slide was more like free-fall. As the group disappeared into the Silver grotto, I took some much needed Curt-time. One of the Grand Canyon’s large ravens stopped by for a chat. Note how the ammunition cans were arranged on the side of the boat. This is so we could have ready access to things we might need during the day: cameras, sun block, snacks, etc. Having determined that I was harmless, the raven settled in on the captain’s chair. I’m sure it would have preferred that I not be there and that we had left some food unprotected. I didn’t get a photo of our group members leaping but this is what they slid off of into the muddy water below. Water was splashed on the rock slide from a pool behind the lip to make the slide more smooth. Or so they said. Next we stopped off at Paradise, as in Vasey’s Paradise. A beautiful waterfall shot out of a redwall cliff and created a Garden of Eden at its base. It was worthy of the name. The waterfall shooting out of the redwall at Vasey’s Paradise, Mile 32. 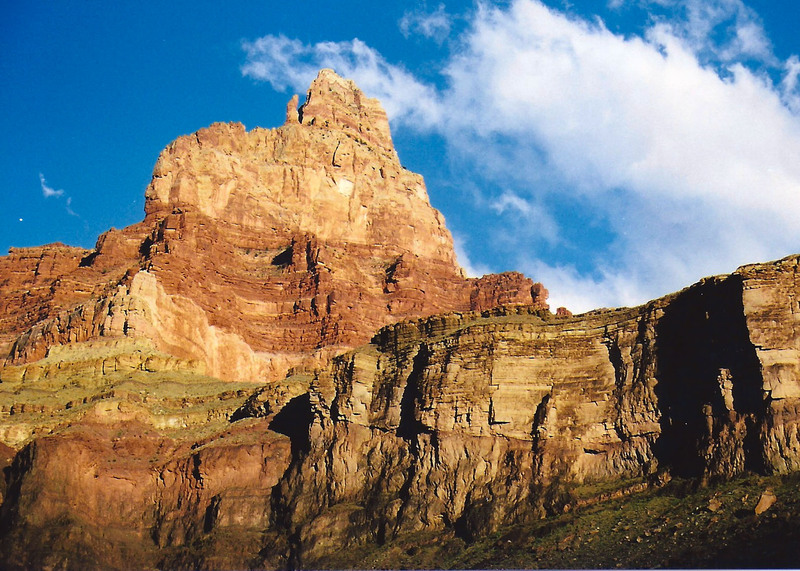 It’s named after a botanist that was part of John Wesley Powell’s exploration of the Grand Canyon. The water for the falls is made up of ground water that seeps down from above and shoots out of holes in the canyon’s wall. Dave Stalheim and his niece Eggin perched on a rock at Vasey’s Paradise. And Jamie retrieves some of the icy fresh water. Whatever work needed to be done, Jamie was always in the middle of it— a good man. 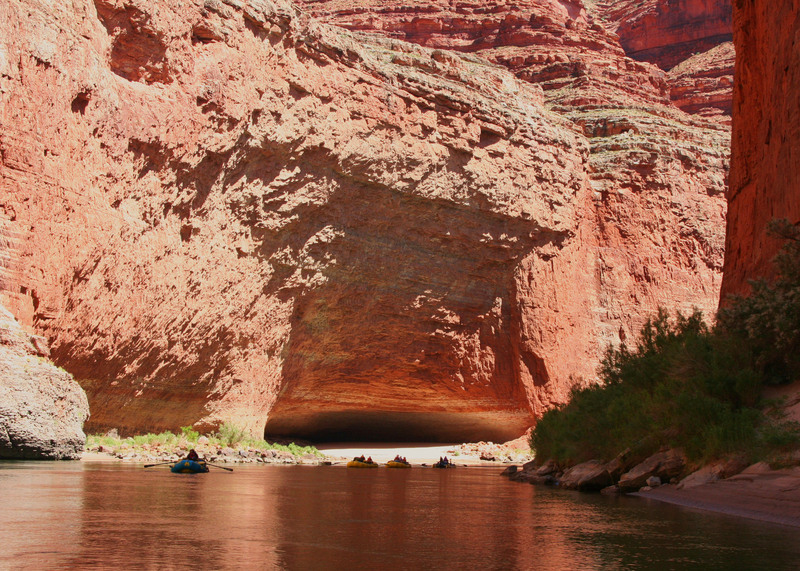 Coming around a bend in the Colorado River, we saw our first view of Redwall Cavern. 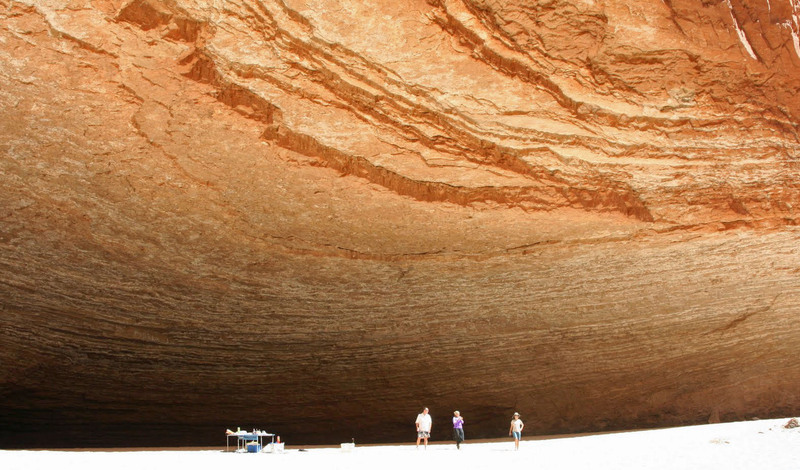 This photo provides a perspective on the sheer size and beauty of Redwall Cavern. Several folks, including Eggin, took advantage of the river here for a cool dip. Next Monday in my Grand Canyon series we will visit an ancient Anasazi storage facility high on the cliffs above the river and play in the beautiful Little Colorado River. Wednesday’s Photo Essay POST: We begin our journey up the Alaska Highway with beautiful views and abundant wildlife. FRIDAY’S Blog-A-Book POST: The Woods, a ten minute walk from my childhood home, teach me a love of the wilderness that exists up until today.